If your website users are logged in and are known for their data (eg . : login, name, nickname, e-mail), it would be very convenient if chat retrieve this information. When a person asks for something in the chat, consultant will see these data immediately. Chater provides this functionality. Example code is shown below, standard one and another wich contains additional parameters. Depending on what technology the site was created, the way of calling users data for chat may look slightly different. The principle of modifying the code remains unchanged. 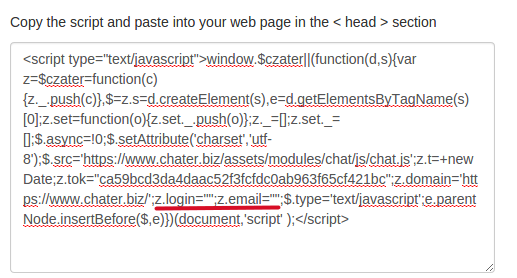 User data must be transmitted to chat script in the same places. 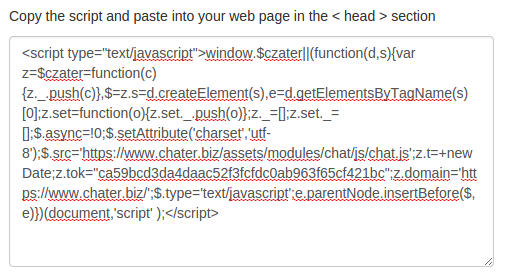 If you have difficulty with this method on your website, please contact us, we will try to help install a livechat with automatic downloading of user data.